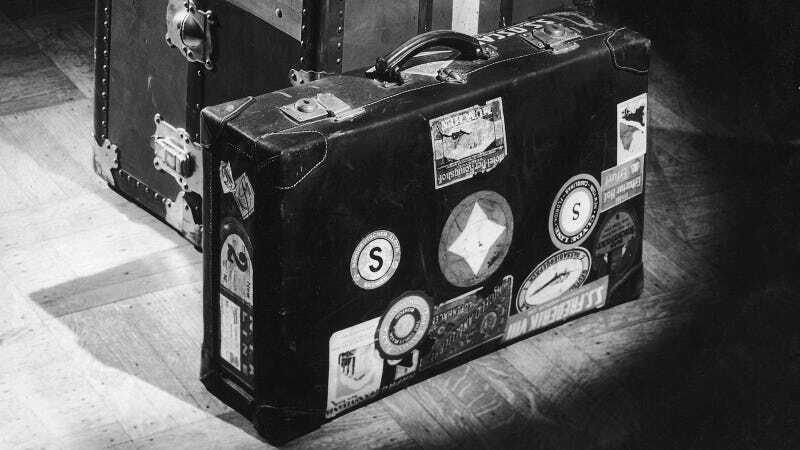 There was a time when well-traveled luggage looked like the suitcase above: covered with travel stickers, trophies of every adventurous explorer. My father, who spent his youth traveling across Europe in the 60s and 70s kept his weary suitcase for a long time; as a child, I admired all those well-aged little pictures of remote hotels and places I'd never been to. Grand Hotel Milan, a 151 years old luxury hotel in the center of Milan, Italy. To the French riviera, and to Canada by Sabena. Sabena was the national airline of Belgium from 1923 to 2001. Hotel Béke, Budapest. Opened in 1913 as "Britannia", renamed after the 2nd World War in 1945 – "Béke" means "peace" –, and still operates as "Radisson Blu Beke Hotel". Malév - Hungarian Air Transport. "Malév" was a Hungarian airline from 1946 to 2012. Cécil Hotel, Nice, France. Built in 1905, still operates as Hôtel Victor Hugo. Gran Hotel Victoria, Madrid, Spain. Opened in 1923, known today as ME Madrid Reina Victoria. Hotel Regina, Trieste, Italy. Also known as Hotel Balkan. It was built between 1901 and 1904, burnt in 1920 by Italian Fascists, and restored from 1988 to 1990. Now it is a university building and library. Laurin Hotel, Santa Margherita Ligure, Italy. Still a seaside hotel under the same name. Dunakanyar, i.e. "Danube Bend" is a Z-shaped curve of the Danube in Northern Hungary. Albergo Torino, Roma. Today: Hotel Torino. Lago Di Como, Italia. Lake Como sticker. Pécs is a Southern Hungarian city, this sticker features its landmark, the 176 meters tall TV tower, built in 1973. Hotel Trieste E Victoria, Abano Terme, Italy. Today: Grand Hotel Trieste & Victoria. Grand Hotel Mediterraneo, Florence, Italy. Still a flourishing hotel under the same name. Grand Hotel Margitsziget, Budapest, Hungary. Built in 1873, still operates as "Danubius Grand Hotel Margitsziget". Hotell Astoria, Oslo, Norway. Today: Thon Hotel Astoria. Hotel Szabadság, Budapest, Hungary. Today: Best Western Hotel Hungaria. Bonus: Malert baggage name tag. "Malert" was a Hungarian airline from 1922 to 1944. All stickers was scanned from the personal collection of the author. Top photo: Hulton Archive/Getty Images.